My trip to Cape Cod wasn't all pumpkin beers and bumming around with talented carvers. It was also foxes. FOXES. There was one visiting my parents' yard in the pre-dawn shadows, and there was one gorgeous fellow at Long Pasture Wildlife Sanctuary that my dad and I watched. See that blob to the right? 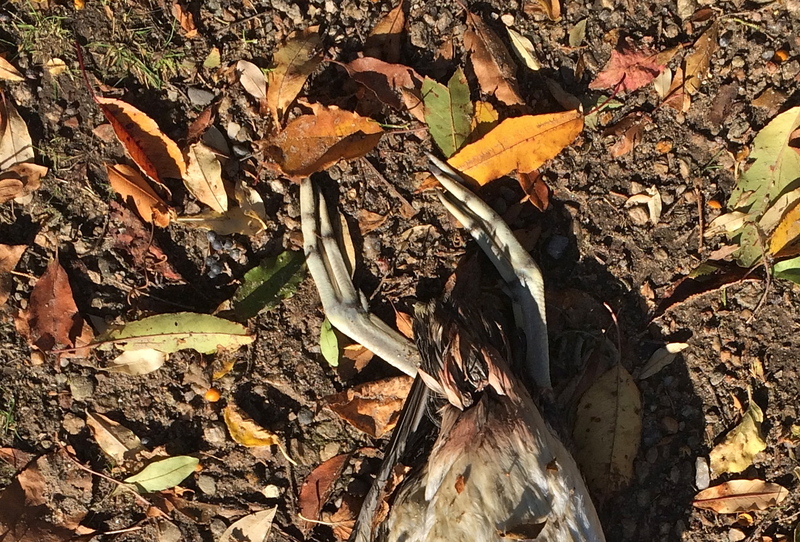 That's a dead coot. A dead, headless coot. A dead, headless coot that this fox wanted. So we waited once the fox spooked into the bushes, and as you can see above, emerged again to retrieve its prize. Another day my dad took me birding at Fort Hill where I was hoping to finally get some Eastern Meadowlarks. In the rain. There was one bird-packed section of the trail where this mockingbird was hanging out along with a ton of sparrows, chickadees, cardinals, and flickers. I found a cool pigment-challenged chickadee in the mix. It's like someone turned him upside down and dipped him in bleach. Nearby a Red-bellied Woodpecker was pecking. We made a big loop around the area and back to the parking lot where I decided to check for the meadowlarks one last time in the field just beyond. Bingo. At least four went flying off, offering decent binoc views and terrible rainy photo ops. I'll spare you. Of course Cape Cod is all about beaches, so we birded some of those too. Eh? Fooled me good for a minute. Anyway. I had a great time on Cape Cod! Another post from Massachusetts to come. Good times!!! OH MY GOSH! That fox is so lovely. I want to cuddle him and his big fluffy tail. Just beautiful. YEAH Eastern Birds on Jen's blog I love it...been a while since I saw a GBB Gull used to see them daily when I lived in Brooklyn those and the horseshoe crabs...awesome fox tale or tail that is teehee..and all gorgeous shots I really love the mood of that boardwalk shot. Excellent. On your warbler, consider leg color, bright contrasting border to tertials, strong face pattern of the eye-line and split eye ring, the yellow upper breast contrast with bright white under-tail, the short looking tail, the white tips to the primaries (zoom in on bird on branch picture), and the hint of streaks on the back..plus a bit smaller bill than you would see on Pine Warbler. It is one of the very difficult three.. Okay, I've taken another look. Blackpoll? I've had very little experience with these Eastern fellows, I should really fix that.